GALION — Ryan Bedson, 32, of Galion was sentenced to 12 months in prison last week after he tested positive for several illegal substances. Bedson had been on probation for three years without any violations. Bedson explained to the court that he thought he was taking Percocet. But in addition to Percocet the random test revealed cocaine, marijuana and suboxone also were present. “You got some watered-down drugs, Mr. Bedson,” Leuthold said. 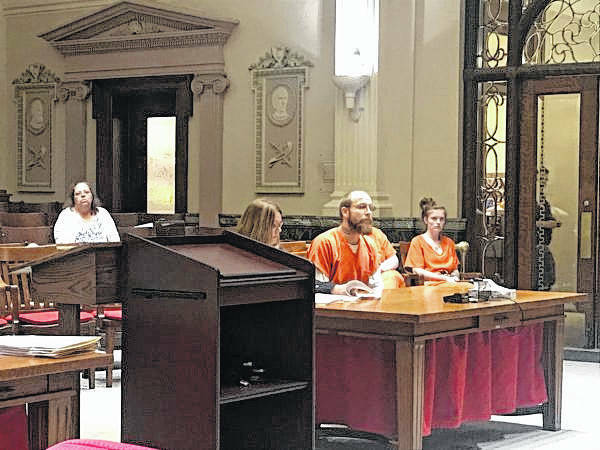 Also last week, Anissa Surgener, 29, of Bucyrus had her original prison sentence of 48 months imposed after she violated the terms of her community control. According to probation officer Dan Wurm, Surgener stole money from her grandmother in November and tested positive for fentanyl in February. “You are careening down a path to kill yourself” Leuthold said. Noting that Surgener tested for fentanyl, Leuthold admonished her on the fact that fentanyl is killing people. “We have been able to curb its effect somewhat in Crawford County because of how I sentence, but it’s very much out there,” Leuthold said. In warning her that she needed to straighten up her life or die, Leuthold reminded Surgener that her three children need their mother. Leuthold also said he would look at the possibility of an early release for Surgener to a community based correctional facility after she serves at least 18 months of her sentence. Also, Shannon Ward, 24, of Upper Sandusky lost out on a chance to participate in an intervention in lieu of conviction program. She was given a chance to participate in the prosecutor’s intervention program. According to probation officer Eric Bohach, practically from the time she was released from jail she had contact with one of the felons. Bohach received calls from various individuals reporting that she was communicating with and living with one of the felons, but it was social media that verified the relationship. According to Bohach, Ward communicated extensively with one of the felons on Facebook. Leuthold placed Ward on five years of community control with a 12-month prison sentence hanging over her head if she violates again. Also, in what she called a “stupid mistake,” Sherry Stone, 48, of Bucyrus appeared before Leuthold for violating the conditions of her probation. She appeared in court with attorney Tom Nicholson. Because her possession charge did not make her prison eligible, Leuthold placed Stone on five years of community control. She will forfeit all drug-related property to the Bucyrus Police Department. If Stone violates the conditions of her community control, she faces 12 months in prison. “I don’t want to put you in prison, but that’s the next step,” he said.